The blind is nearly complete once hog wire is attached for adding natural cover. Ken and Ed Veselsky of St. Louis, Missouri said they didn't notice the Boats & Blinds Contest in Wildfowl Magazine until their construction of a new floating blind was already underway. Nevertheless they decided to start documenting the construction process by taking photos. 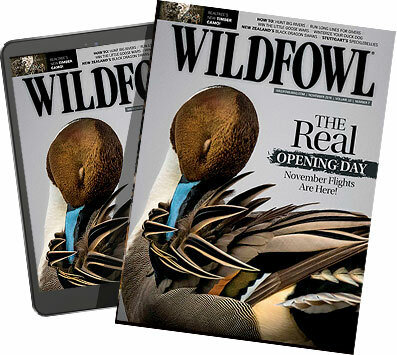 Wildfowl readers should be happy they did so because the floating duck blind was judged to be the first place winner of the 2007 Boats & Blinds Contest. The Veselsky brothers have been hunting together for more than 30 years and have built and hunted from many different types of blinds during that time. "We've learned the only way to make a floating duck blind is out of steel," Ken Veselsky said. "Steel doesn't rot and the beavers can't chew through it." The Veselskys learned the hard way that beavers enjoy munching on Styrofoam floatation, which is not a desirable situation when hunters go through all the hard work and time required to build a blind. Arriving for a hunt in the early morning and finding the blind has a distinctive beaver created list is not conducive to a happy duck hunt. The floating sections were built in sections and taken to the site. Once the floating base was in place, the walls and roof were built in place on the water. A pontoon boat was used to ferry hunters and materials to the blind site. "There are two floats on our blind," Veselsky said. "The main float holds the blind and the second float carries the boat hide. The second float also acts as a stabilizer for the blind so it doesn't teeter." The float chambers are still filled with Styrofoam blocks. But the blocks surrounded and protected by steel cages. The cages are made out of 11â'„2- by 11â'„2- by 1â'„8-inch angle iron. The cages are lined with 0.80-inch aluminum sheeting welded to the angle iron frame. There are two float chambers forming the blind float. These two chambers are at the front and back of the blind. These two float chambers are each 16 feet long, four feet wide and 21 inches high. The blind is 16 long and eight feet, two inches wide. The boat hide is 20 feet long and eight feet wide and extending beyond the main blind on either side by two feet. A single float chamber runs along the outside of the boat hide and this float chamber is 20 feet long, four feet wide and 21 inches high. From the front of the blind to the back of the boat hide, the blind is 18 feet, three inches wide. The entire blind and hide is built together to form a single floating unit, with the three float chambers placed parallel to one another. "Over the years, we found that the better you protect the Styrofoam the longer the blind will last," Veselsky said. "You can look at the pictures of our blind and see there is no Styrofoam exposed anywhere on our blind." The floats are joined together with two- by four-inch tubular steel. All of the joints are welded. "The tube steel is really the muscle of the whole structure," Veselsky said. "This stuff is mean! It not only holds all the floats together, it is also provides the tie down points for the anchoring system. Each end of the tube steel has a 1â'„4-inch lifting lug welded to it, for firmly attaching all four anchors. With the frame welded together, we have a floating platform ready to house the blind." View of the floating blind and the entrance to the boat hide. The anchors are attached to the lifting lugs with turnbuckle arrangements. The anchors are screwed into the bottom for the season, or until the hunters want to move the blind to a different location. One anchor is set at each corner of the blind. Nine hat track sections are mounted on 24-inch centers on top of the floats. While steel framework holding the float chambers together are welded together, the hat track sections are bolted to the framework. The hat track sections are 16-gauge galvanized steel. The floor and walls are mounted to the hat track sections with bolts and nuts. The floor is made of plastic decking material, which is the same type of decking that is used for building marinas and boat docks. "The decking is called Choic-Dek," Veselsky said. "It is very important to use a flooring that doesn't rot. Anyone who has ever owned a blind knows that the first thing to rot is the floor. It costs a little more for the waterproof deck material than for wood. But you'll never have to worry about it again. It comes with a lifetime guarantee when used for decks, but probably doesn't apply for the product's use in a duck blind." The walls are made of two- by four-inch cedar lumber and 3â'„4-inch birch plywood. Veselsky said they have found that white pine rots so quickly, they are lucky if it lasts three or four years, even if it's painted often. "We could have made the walls out of steel studs and metal sheeting," he said. "But the metal walls would have made too much noise and been very cold in winter. Also, anywhere there's a flat spot where water can sit, the walls are covered with aluminum. At the bottom of the walls, we added an aluminum cant strip so any water running down the walls is diverted and cannot sit on the studs. There is an aluminum coping on the top of the walls. No matter how you build your blind, you have to cover all of the exposed wood with aluminum to waterproof it, or it won't last long." Once the walls are attached, the roof joists are added. The roof joists are made of two- by four-inch and two- by six-inch white pine lumber with 5â'„8-inch Walmanized plywood nailed on top. The roof exterior is vinyl. The vinyl is anchored to the main header and end joists on one side before the plywood is added. Once the plywood is attached, the vinyl is rolled up and over the plywood. The vinyl is nailed in place, with special attention along the outside edges of the roof where the vinyl overlapping on the outside walls. Overlapping the vinyl keeps the wind from blowing the vinyl off the roof. Covering the roof with vinyl keeps down costs by allowing the use of white pine joists and plywood underneath the vinyl. ack. The front wall of the shooting opening is 48 inches high. The opening is 311â'„2 inches wide along the entire 16-foot front of the blind. The peak of the roof is located at the rear of the shooting opening and is 591â'„2 inches high from the floor to the top of the roof. It slants to the rear, toward the boat hide at a continuous slope. The rear of the blind compartment is 551â'„2 inches high from the floor to the top of the roof. The width of the blind from the rear of the shooting opening to the rear wall is 58 inches. Entering the boat hide of the completed blind. The walls are painted once the roof is complete. Once the walls and roof are in place and the paint is dry, the entire exterior is covered with six- by six-inch No. 9 hog wire. The hog wire is used to hold brush for camouflaging the blind. After the hog wire is installed, the entire exterior undergoes a touch-up paint job. It takes eight boatloads of brush to cover the blind. A series of long eyebolts is also welded around the bottom of the blind walls. These eyebolts extend outward several inches and are also used for securing camouflaging brush. "The inside of the blind is built for comfort," Veselsky said. "First, we made a seven-foot couch for the blind, in case you would like to take a little nap on those slow days. Then we installed a 30,000 BTU range, with three burners of 10 KW output, at one end of the blind and a 25,000 BTU furnace on the other end. If you get cold in this blind, you really need to find a different sport. We also installed overhead lighting inside the blind and in the boat hide. We used 12-volt camper lights and a car batter mounted on the back float to supply the electricity." Several safety features are built into the blind. The first feature is a very tall entrance into the boat hide. The entrance is 69 inches tall from the bottom of the floats to the top of the roof. The tall entrance prevents a hunter from bumping his head if the water is rough and the boat is bucking when the boat enters the boat hide. There are three fire extinguishers aboard, including two 10-pound fire extinguishers in the blind and a 20-pound fire extinguisher inside the boat hide. There is a fully equipped first aid kit hanging on the inside wall, complete with all available emergency telephone numbers. The blind has five overhead lights for good visibility when moving gear and guns from the boat to the blind. "Besides all the other safety equipment, the blind even has a flare gun," Veselsky said. "But I hope we never need that, either. "To access the blind and put out decoys, the Veselskys rebuilt an old Polar Kraft johnboat. They stripped the boat interior down until the only thing remaining was a bare hull. Then they added new aluminum floors and decks. They also added a new transom and mounted a jet drive motor. Then they installed a new console, steering and wiring. They estimated that rebuilding an old hull saved approximately $8,000 over the cost of buying a new boat. The boat fits neatly and securely inside the boat hide. A door opens from the boat hide into the rear wall of the blind. With proper care and maintenance, Veselsky said the blind should last for 15 to 20 years. He said the previous blind lasted for 13 years and wasn't as waterproof as the latest rendition. "It's a blind so tough if you hit it with your boat, you're going to mess up your boat, and not the blind," he said. "Yet the blind is so comfortable, you don't even need to wear long underwear." Jeff Geeseman is from St. John's, Michigan. After fishing and hunting from boats from Michigan to Alaska, he and his brother-in-law, Craig McLachlan, made the decision to build a diesel-powered duck boat. Duck'N Off's diesel engine powers twin mud motors, offering zero turning radius and reverse drive. "After starting with an AlumaCraft 2072 boat, we added a 60 horsepower turbo diesel motor," Geeseman said. "The drive for this craft is provided by diesel over hydraulic that runs twin Mud Buddy drives with hydraulic variable displacement pumps. The set up provides a zero turn radius as well as a reverse drive. "We have all found ourselves in places where the reverse drive is handy," Geeseman said. "We dumped it into bogs and hay marshes to see if it would go and you just can't stick it. You wouldn't even hunt ducks in some of the stuff we've tried it out in." The engine has a 1 KW, 115-volt converter. The converter allows the use of an electric coffee pot for brewing fresh coffee anytime the hunters are out on a lake. It even allows using a microwave oven. "Even with the live well, gun box, rod box, bilge pump, and 24-gallon fuel tank, there is plenty of room to load a 4-wheeler in the bow of the boat to get you and all your gear into the deep cover on an island to do a little bear hunting," he said. "Minus the quad, the craft has a seven-inch draft. A removable duck blind provides cover and we can move fast to an area and set up decoys wherever we find ducks are choosing to land." After getting a few kinks worked out Geeseman said the setup works great in big water or marshes. The motor is mounted on a few extra structural aluminum ribs using standard rubber motor mounts. "From summer fishing trips to breaking ice to get to those last few ducks in open water 'Duck'N Off' is a perfect place to spend time with your buddies or quality time with the kids."